One, “It is wrong that a woman and man cannot marry off their child until she is 16,” according to Obaidullah Barekzai, a member from southeast Uruzgan province. Female literacy rates are at rock bottom in Uruzgan. Plus: those laws about punishing someone just for beating his wife are definitely un-Islamic – this from all those mullahs who know exactly what Allah has in mind. The New York Times story on the above was illustrated by a photo of a man in a Kabul store, dressed in a tee shirt and colorful scarf, standing amidst racks of pale blue burqas. 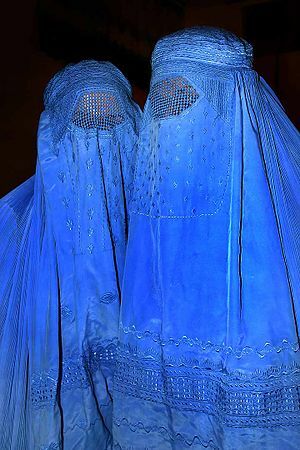 Burqas, shapeless head-to-toe coverings, also come in black, but perhaps that’s another store; they are requisite outdoor-wear for women in many areas. If you look closely at the Times photo there is an actual woman in the background; you can tell because her hands are visible. An even closer look reveals what seems to be another woman in another burqa, though it’s hard to tell; the idea of the burqa is to render the woman inside invisible. Many of us think that the U.S., given the history of countries trying to intervene in Afghanistan, should never have tried to intervene in Afghanistan. Probably many more of us simply want the U.S. to get out. But if you’re a woman in the U.S., holding the women of Afghanistan in your heart, it’s hard not to weep for them all – and to count your blessings.